This weekend: MST in a Day - GetGoing NC! The MST is well-marked through Holly Shelter. We’ll ‘fess up up front: We’ve been working with the Friends of the Mountains-to-Sea Trail to help them promote MST in a day, what the American Hiking Society believes would be the first time a long trail in the United States has had every inch hiked in a single day. That would be quite an achievement, and one we don’t want to leave to chance. As of Thursday afternoon, 245 legs of the Mountains-to-Sea Trail had multiple hikers signed up to hike. The remaining 55 each had one hiker, which is leaving the milestone to chance. So today, we’re going to identify the 55 legs with a lone hiker, give you a sense of what those legs are like, then let you know where you can sign up to give those legs some added support. The skinny: As you may know, not all of the Mountains-to-Sea Trail is complete. 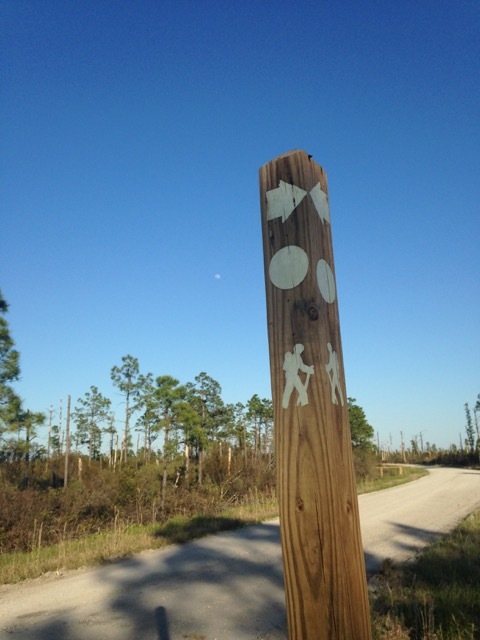 Of the current 1,175-mile route, about 680 miles is actual trail or beach hiking; the remainder is temporarily routed on roads. The one-hiker legs at the coast fall largely into that category. So it’s a different type of hiking we’re talking here. More walking, really. If you go back far enough, think hitchhiking without the thumb. Which isn’t to say there isn’t a lot to see. Au contraire, from Civil War battlefields, to a former Rosenwald school, to museums that tell the story of the last two or three hundred years of living Down East, there is plenty to see. There are carrots on these hikes, carrots especially worth the hiking (or whatever) on a gorgeous late summer day (see forecast below). Saturday forecast: Sunny, with highs in the mid-70s. How and where to sign up: Go to MSTinaday.org, scroll down to the trail map divided into segments, click on your segment-of-interest. You’ll be whisked to the page for that segment, where you’ll find information on each leg: length, difficulty, surface type, start and end points. You’ll also find the Eastbound Trail Guide Miles: go to the online trail guide section, click on your segment, then find the ETGMs; there, you’ll get a more detailed sense of what the leg is like. Back to the MSTinaDay segment page, click on “Sign Up Now” and you’ll be taken to the Meetup registration site (it’s free and relatively hassle free). The skinny: Segment 11A-16A is a paddle route on the Neuse River, from the Falls Lake dam in Raleigh to just below New Bern. The upper legs of the Neuse have a detectable current (even an easy rapid or two), things slow down as you reach the coastal plain. The legs here are long (most have double-digit mileages), remote, peaceful. If you’re looking to take advantage of Saturday’s fall-like weather (see “Saturday forescast” below), sign up! In the beautiful Elkin Valley, in an area bridging Stone Mountain State Park with its sister Pilot Mountain, these sections are also on country roads, but country roads that visit places such as Shorty’s Country Store and the Grassy Creek Vineyard and Winery. And, Legs 8 and 9 visit Elkin, currently the premier trail town on the MST. Saturday forecast: Sunny with highs in the mid- to upper-70s. The skinny: How are there neglected legs in the mountains? you ask, in the Smokies, no less? In the case of Section 1A, because of the lack of access, some of the legs are especially long: Leg 2 is 21.5 miles; Leg 3, 14.3 miles — and these are Smokies’ legs. And eight of the legs are on paved roads. But in the Smokies! And, again, on a day forecast to be more fall-like than summery (see Saturday forecast, below). Saturday forecast: Sunny, highs from the 50s to low 70s.